Serolo Safari Camp is located in the Northern Tuli Game Reserve in Botswana and offers guests an authentic African bush experience in tents on the Limpopo River banks. Serolo Safari Camp is privately owned and managed by a conservation-focused team. Game drives at this Botswana game lodge boast unrivalled wildlife sightings and the absence of large numbers of safari vehicles, ensuring an authentic bush experience. Game drives can take place at night and vehicles can follow the animals off-road for improved game viewing. The Tuli reserve is home to ancient San rock art sites and a strong archaeological heritage. Return to the camp and enjoy freshly prepared meals that are served either indoors or under a canopy of trees. 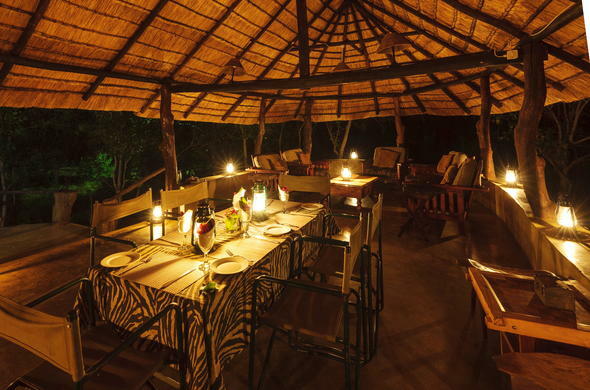 After the night game drive, enjoy an al fresco dinner and post-dinner drinks as you admire the shimmering night sky.